As seen in the November 2016 issue of Model Aviation. Model Aviation would like to extend a special "thank you" to NJ Hunt and the Fox Valley Aero Club for providing us with this great highlight reel from the event! Warbirds and classics of all eras graced the skies over St. Charles, Illinois, the weekend of June 23-25 for the third annual Windy City Warbirds and Classics Air Show, but it was the camaraderie between volunteers, pilots, and spectators that made this event so special. Fox Valley Aero Club has been in existence for nearly 88 years and consists of 180 dedicated members. The flying field is immaculate. Nestled behind a 911 dispatch center and surrounded by cornfields, it features a 50 x 100-foot blacktop runway with a parallel, mowed grass runway that is 100 x 600 feet—perfect for all types of warbirds, classics, helicopters, and aerobatics airplanes. Fox Valley is also a part of the Warbird and Classics Alliance, a group of RC airplane clubs and pilots who are dedicated to sharing the love of building and flying Giant Scale warbirds and classics that have historical significance. The Alliance is associated with several events that take place in the Midwest and in Canada. Linda Crooks coordinates the magnificent noontime air show that the Alliance puts on at each event, and it definitely did not disappoint on Friday or Saturday at Windy City! The crowd was highly entertained and all eyes were on the sky from the moment it started until the last flight. From World War I and World War II, to Cold War, Vietnam, and modern-day military aircraft, as well as flights of turbine jets, airliners, civilian general aviation airplanes, and a dedication and salute to those who have served in the military, the crowd’s attention never wavered and applause could often be heard among the roar and hum of gas engines and 1940s-era music in the background. Linda Crooks (R) discusses the noon air show lineup with (L-R) Fox Valley Aero Club President Arvin Cole and event coordinator John Fischer. Linda coordinates the noon show as part of the Warbirds and Classics Alliance. Spectators lined the outside of the chain-link fence to the back of the pilot pits and runway on Friday to watch the noontime air show. It was standing- room only as warbirds of all types—from World War I to modern day—flew one after another to narration provided by R.J. Monroe. In addition to the noon air show flights, a candy drop was held on Friday afternoon for children. Spectators were invited out onto the runway, where pilots had positioned their airplanes in two rows. Those interested could walk up close to see the airplanes, and ask the pilots questions about the hobby and their aircraft. Many, who had never been so close to a scratch-built model aircraft with handcrafted detail, were amazed. The pilots loved answering questions about their passion and hobby. On Saturday, the noon show took place again, and the crowd was surprised by a full-scale L-39 flyby! Snoopy, the World War I flying ace, battled the Red Baron in the sky during the Warbirds and Classics noontime air show. Pilots lined up their airplanes in rows on the runway after the noontime air show on Friday, and spectators were invited to have an up-close-and-personal look at the aircraft and ask the pilots questions. Both spectators and pilots thoroughly enjoyed this! Another Giant Scale model was Ted McClellan’s C-130, which he bought on RCUniverse. It features four-stroke Saito FA-115 engines and 12 servos. It also has an RC skydiver that drops, but Ted didn’t have another pilot available to help operate the drop. A 50/50 raffle during the event benefitted the Tri-City Salvation Army Angel Tree Program—a program that the Fox Valley Aero Club sponsors with fundraising efforts and donation drives to help more than 1,300 St. Charles-area families in need. Headed up by Fox Valley club members John Turner and Sal Perno, the Windy City Warbirds and Classics raffle raised $256 to go toward the group’s annual contribution to this program. In between, the flying hardly ever stopped. One after another, pilots lined up in succession to take their turns at one of the eight flight stations marked on a fence of netting. Yes, there were a few mishaps, and flying stopped until an aircraft was fished out of the cornfield to the west of the runway, but after it was cleared up and pilots were safely back behind the netting, flying quickly resumed. What I noticed throughout the event was the spirit of both the visiting pilots and Fox Valley club members and volunteers. It was infectious, and everyone was happy to be there! Events such as this are as much about the social aspect of getting together with other like-minded individuals as they are about flying. Some pilots bring their airplanes, yet the aircraft never make it into the air. It’s more about being among friends who might only be seen once or twice a year at other events, or showing off what was on the building board during the previous winter. One unique model at the event was a Polikarpov I-16 Rat built by Wolfie Donalies. The Soviet aircraft was the first monoplane fighter design from the 1930s and first flew in 1933. It took Wolfie 2.5 years to build the Rat, which he scratch-built from plans. It features a ZDZ .80 single-cylinder engine and no flaps. Pilots often visited each other’s canopies to shoot the breeze, laugh, make dinner plans, and trade building secrets. They were also there to help fellow pilots in need. If an airplane crashed or had problems, others were there to help pick up the pieces, put an airplane back together, or give advice. I also noticed that safety was paramount at this event. Spectators were kept behind a chain-link fence and not allowed beyond it. Spotters had marked paddles to inform other pilots of takeoffs, landings, or low passes. Dave Cotton was the boss in charge of flightline safety, and he earned his nickname “Shooter” for a reason! He had everything in order—from lining up the airplanes on the tarmac for flight, to making sure no one was landing before another took off, to assisting in the run up of engines, and taxiing on the runway. He was as succinct as a machine and kept everything going as smooth as clockwork. Dave was always fun to watch—using arm motions while he coordinated with others in the flightline safety crew and with the pilots. The flightline safety boss, Dave “Shooter” Cotton, kept aircraft in line on the tarmac and on the runway by coordinating takeoffs and landings. Ronnie Coleman, age 16, was the youngest pilot at the Windy City Warbirds and Classics. Ronnie said he has been interested in model aircraft since he was little and asked his parents for an Air Hogs model before moving up to hobby-grade aircraft. He flew his Top Flite P-47D Thunderbolt at the event, as well as Lee Watkins’ Stuka to get the feel of it because he is building his own. Each volunteer had his or her duties down to a science. Gate workers took money for admission and parked cars, several manned a booth with event T-shirts and hats, and volunteers at the registration table signed up pilots to fly. Fox Valley Aero Club President Alvin Cole was often seen walking from one end of the flightline to the other, making sure everything was going smoothly and safely and that everyone was having a great time. R.J. Monroe was excellent as the voice of the Windy City Warbirds and Classics, using the microphone to relay historical information about each airplane to the spectators. All logistics were planned out, and all volunteers served a purpose, but they also had fun and always kept smiles on their faces while they were working. The club featured a movie night after dark on Friday at the pavilion. With a provided projector and blowup movie screen—complete with popcorn, of course—the classic movie 1941 was shown to approximately 30 people. Saturday night was the pilots’ dinner, raffle, and awards ceremony for the event. The awards were beautiful—framed and matted, black and white lithograph aviation art drawn by Doug Kinsley, owner of Aviation Illustrations. Chad Asmus from Balsa USA, one of the sponsors of the Windy City Warbirds and Classics, also announced a special raffle prize for event volunteers. With excellent food, a large audience, and lots of applause and laughter, the official event concluded on a high note. 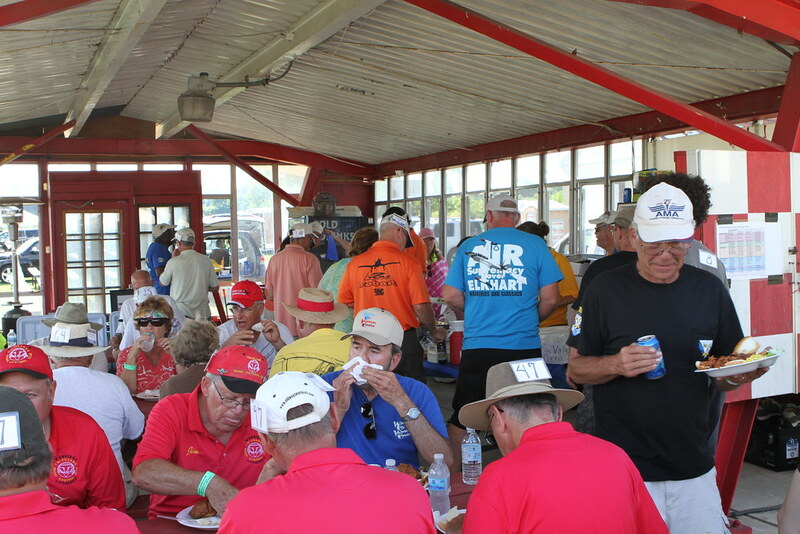 Pilots, volunteers, and Fox Valley Aero Club members enjoy dinner on Saturday evening. Gathman photo, provided by Fox Valley Aero Club. Award winners received one-of-a-kind lithograph aviation drawings from Aviation Illustrations. (L-R): Jeff Edstrom, Alan Galle, Debbie Howe, Katie Howe, John Howe, Ted McClellan, Bill Suhr, Orvil Fluharty, and Scott Stampfli. Photo by Dale Gathman, provided by Fox Valley Aero Club. I made many new friends at this event, including Tom Flint, Fox Valley Aero Club’s public relations coordinator, who was also my tour guide and main contact for the event. As he summed it up, Windy City Warbirds and Classics has turned into a classic event itself. It’s a testament to what this hobby is all about: a long-standing club with dedicated, welcoming members that puts on a great event, bringing in even better pilots, aircraft, and interested spectators who might have never seen anything like this. If you love all of these elements wrapped up into one place, make sure to put the Fox Valley Aero Club and the Windy City Warbirds and Classic event on your list. It’s definitely one not to miss!